Το Σχολείο μας συνεχίζει την επιτυχημένη συνεργασία του με Ιnternational Schools. Την προηγούμενη σχολική χρονιά (2013-2014) κατακτήσαμε το 1ο επίπεδο, Foundation Level, του International School Award, μιας διεθνούς πιστοποίησης που αναγνωρίζει τη δέσμευση του Σχολείου μας να διαμορφώσει τους νέους παγκόσμιους πολίτες του αύριο. Το Foundation Level του International School Award αναγνωρίζει την προεργασία των σχολείων για ένταξη διεθνών στοιχείων και εμπειριών στο πρόγραμμα σπουδών τους. Ακολουθεί το Intermediate Level και στόχος μας είναι το πλήρες International School Award (Accreditation) που πιστοποιεί την ενσωμάτωση διεθνών στοιχείων στο πρόγραμμα σπουδών. 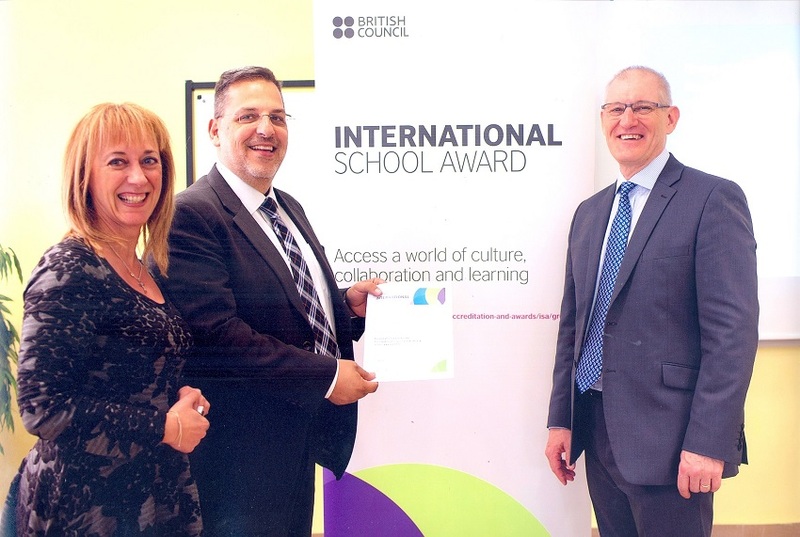 The International School Award is an internationally recognised accreditation for a school’s international work. In I.M.Panagiotopoulos School, we believe in enriching education through opening a window onto other cultures, thus encouraging global citizenship in young learners. Our school is running the Social Inclusion programme which helps young people become more aware of global themes such as identity and belonging, sustainability, rights and responsibilities. We decided to establish a partnership with a school overseas to teach our pupils about life in other countries and develop them as global citizens. This is why we came into contact with USKUDAR SEV Elementary School in Istanbul, Turkey and worked together on the programme “Friendship across the Aegean” in 2013. Having started our journey into the stimulating world of international learning, we applied for the International School Award. 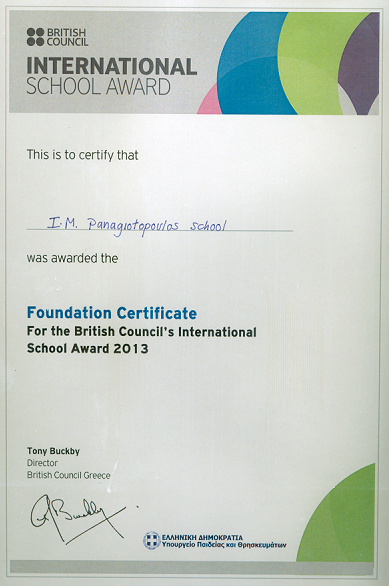 During the International School Award ceremony which took place at the British Council, Athens on 28th March 2014we were awarded the Foundation Certificate for our international work. We intend to develop international work in our school so as to move up to the next step of the award. During the 2013-2014 school year, we formed a partnership with the International School of Venice and the International School of Trieste and worked together on the programme “Friendship across the Ionian and Adriatic Seas” thus proving our strong commitment to the use of creativity and internationalism to improve standards in our school.